Stranger Worlds: DEMON ROAD // author hangovers, gender dynamics and character loyalty. 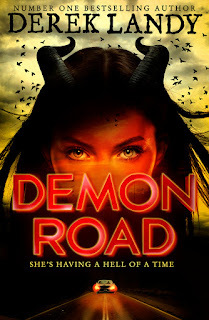 DEMON ROAD // author hangovers, gender dynamics and character loyalty. I rarely buy books when they come out. Hardbacks are expensive, and I normally prefer to wait and find the book secondhand. Also, I'm very rarely reading a series as it's coming out, so I don't often have the agony of waiting. When a book comes out that I want, I normally wait a few months, visiting it in Waterstone's every now and then, and eventually fork out for it. This was not the case with Demon Road. After the end of Skulduggery I was bereft, and I could not wait for Derek Landy's new series. I bought Demon Road, in hardback, for an extortionate sum of money, on release date. I then didn't read it for six months. Author hangovers: I've talked about them before. It's when you love a book/series so much that you're terrified to read the author's other work, just in case it's not as good, because then you have to accept that the author is not the Perfect Ruler of All as you thought they were. It's why I took so long to read The Cuckoo's Calling (JK Rowling) or Wolves of Mercy Fall (Maggie Stiefvater), because could anything be as good as Harry Potter or The Raven Cycle?! In both those cases, I was not disappointed, but I still kinda procrastinated reading Demon Road. Twelve hours before Amber Lamont's parents tried to kill her, she was sitting between them in the principal's office, her hands in her lap, stifling all the things she wanted to say. So, it's no secret how much I love Skulduggery Pleasant, Landy's nine book urban fantasy series. Heck, my blog url is a Skulduggery reference. He is my top #2 ever fictional crush. I ... need a minute. I was afraid of disappointment in Demon Road, and initially, I was disappointed. ~ First things first, it's less my genre. Urban fantasy is one of my absolute favourites, but this is paranormal/horror, and I'm not so into that scene. In Skulduggery the characters are mages and there is all sorts of awesome magic, but demons I'm not so keen on. Also, anything that takes Biblical ideas and twists them makes me squint a bit. ~ I prefer the Irishness of Skulduggery. This might be a stupid reason. I know that if you're writing a book about a road trip, setting it in the British Isles is not wholly feasible; America is the obvious choice. But, uh, I just like the Irish characters more. Glen from Demon Road is Irish, which is nice. Landy couldn't resist, clearly. ~ Let's discuss the characters. I made a handy infographic to illustrate what I'm talking about. There are some differences! For one thing, Amber is far less arrogant and annoying than Valkyrie. In Valkyrie, Landy gives us a fairly typical beautiful, confident teen heroine. One of the themes of Demon Road is perceptions of beauty, and Amber doesn't fulfill societal norms of beauty, which I really liked. But ultimately, they are fairly similar characters. Milo, meanwhile, is not as loud/brash as Skulduggery, but they are basically the same. And Glen could be Fletcher with a different name. I was thinking about gender dynamics and why Landy chose to go for a teen FMC and a middle aged MMC once again. I think it is extremely cool that he flies the flag for YA heroines. The Skulduggery Pleasant books are marketed for boys, with their covers, and the title makes you think he's the MC, but Valkyrie is the POV character, and I love that Landy doesn't bow to the pressure to write “boys' books" with teen boy heroes. Obviously I'm not saying we don't have enough girls in YA, because we have squillions, but they are almost all in books that are either romance-based or feature romance. There's nothing wrong with romance, but the sort of Harry Potter / Artemis Fowl / Percy Jackson / Jamie Carpenter / Otto Malpense / James Adams / Thomas from The Maze Runner action hero doesn't have many female counterparts. So thank you, Derek, you absolute babe. However, just because the MC is a girl, why go for the Skulduggery/Milo figure twice? I suppose the obvious answer is that he is a middle-aged man and we all quite like to write about ourselves in various manifestations, but still, it's an interesting question. Now, can we talk about character loyalty? So when I saw very similar characters Amber and Milo having banter / sassing each other, like Skulduggery and Valkyrie do, it made me quite jealous? [Milo:] “We all go through tough times." [Amber:] “My parents are trying to kill me." [Milo:] “We all have issues." Does anyone relate to this?! Maybe I'm just weird (I mean, I am just weird. We know that.). But Landy has such a distinctive funny style, and when I read his humour not being used by the Skulduggery characters, I think it just made me really nostalgic to read about them. This meant they were in my head my whole time, and by comparison Amber and Milo came out unfavourably. This is not to say I didn't like Demon Road, because I did! It was quite magnificent, in the end, and I gave it four stars! For one thing, the character thing kind of went away as the book went on. The infographic, I know, makes out that both books have central trios, but actually only Demon Road has a central trio. 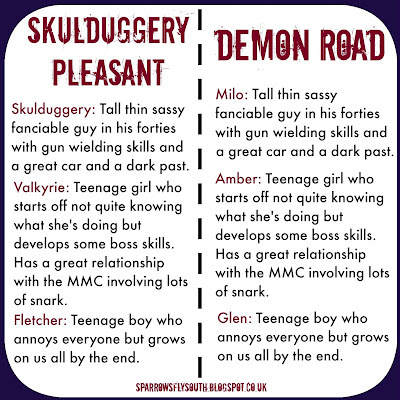 Skulduggery has a whole raft of awesome characters, and Glen isn't that major. 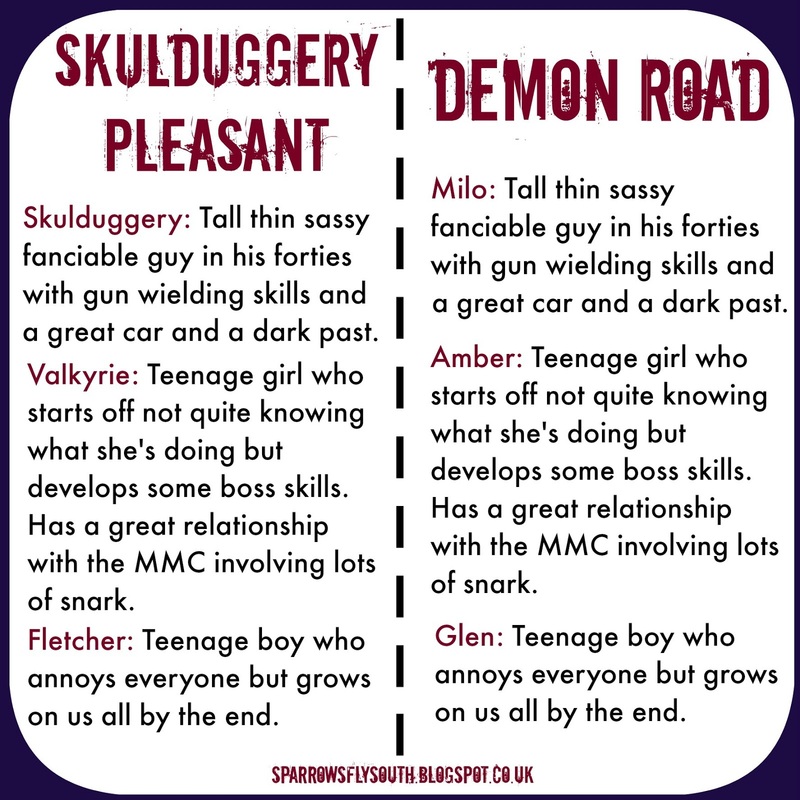 So whilst Skulduggery is all about the relationship between him and Valkryie, Demon Road focusses more on Glen and Amber's relationship, which was different, and I liked it. The action scenes were A++. Landy is a king. I do really love Amber. I was rooting for her. And her fandom! And I love that Landy actually knows how people talk in online forums and what fandoms are like and how important gifs are and the relationships people have with their online friends. Sometimes “texting" in books makes me cringe so much, when it's written by adults who don't know how teenagers speak, but the fandom chat in Demon Road was perfect. I love characters who love books. All in all, nothing can replace Skulduggery in my heart, but I really liked this book and cannot wait to read Desolation, which comes out tomorrow! Do you get author hangovers? And can you relate to my character loyalty problems? Also, have you read Demon Road? I got this one from NetGalley, can`t wait to read it! I need to read Skulduggery Pleasant too! You'll like it! And Skulduggery is life and happiness. Yes, I totally get author hangovers - I have even started the Galbraith books yet for that reason. I really liked the first Skulduggery book which I listened to on audiobook (the production was wonderful, by the way) and I want to try this one too. THEY'RE SO GOOD THOUGH. I can't wait to read Career of Evil. Dang. Yes, tell me what you think! Nothing can indeed replace those first loves! (Though I am reading Forever, Wolves of Mercy Falls #3, at the moment, and LOVING it. Stiefvater is a queen.) I really did like Demon Road despite my qualms and am looking forward to the sequel! So I've never read a Derek Landy book. But I always get told that I should. . . I do see what you mean though about read similar characters by the same author and, yeah. I'm not sure if I've ever had that, because I don't read enough from one specific author. But I do see what you're saying and it does make sense. Especially when the character dynamics are so similar. I like what you say about Landy using female MC for a "boy" books. I never thought of it that way. But you're right! That's very cool that he can pull that off. Now I need to read a Landy book. I was talking to a friend about this today, actually, how we have so many authors to read that we rarely revisit the same ones! I can think of very few authors from whom I've read more than one series, or even more than one book. I've read five Austens which is really unusual for me. That's probably the most book I've read from one author not including longer series. But yeah. It's so cool! Hence you should read Skulduggery, like, now. If you like Derek Landy, you should try the spooks apprentice!